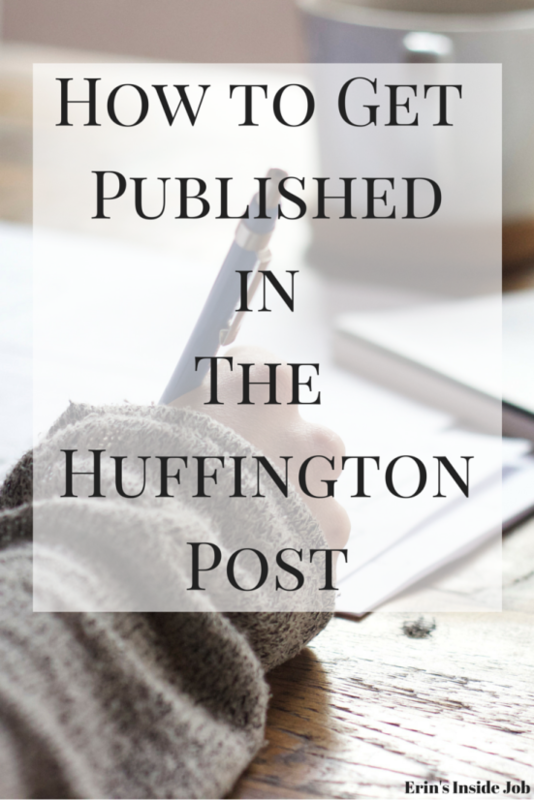 Last week I wrote an article that was featured in The Huffington Post. Since then I have received a lot of questions as to how I managed to get published, so I wanted to take some time to go over the process that I went through. Keep in mind that this was my experience and it is by no means the only approach to getting published in The Huffington Post! I had submitted an article previously to The Huffington Post around the time that the Victoria’s Secret Fashion Show was airing. I had written a post last year about why I no longer watch it and I thought that it would fit nicely. I headed to their Contact page where there is a link to submit pitches, filled out the form, and didn’t hear anything back. Granted, I submitted the pitch the day of the fashion show, but ultimately I put my aspiration to be in The Huffington Post on the back burner for a little while. I actually ended up submitting this most recent pitch while procrastinating. I didn’t want to study for my NASM exam, so I decided to rework the speech that I give at drug abuse forums and submit it. I did some internet research about how other people have been published and decided to go on an emailing rampage. One of the most valuable pages on The Huffington Post site is the list of editorial staff. You can find this list here. Hi! I wanted to share my story with you in hopes that you would consider it for The Huffington Post. I was an honor roll student who lost everything to my addiction and have managed to build up my life again piece by piece through recovery. My story is compelling because I do not fit the “stereotypical” addict mold and I strive to inform others that addiction can affect anyone, anywhere. I am attaching my story, picture, and bio. Please let me know if this is something that you are looking for. Thank you for your time and have a great night! I kept the body of my email relatively short and concise, then sent it out along with a copy of the article and my bio and headshot. I think it is best to have your article written already rather than simply pitching them an idea. I wrote my story the way I would want it to be posted and then attached it with my pitch. Unless your pitch is extremely compelling, an editor may not have the time to go back and forth with you about a subject. You have a limited amount of time to get through and grab the attention of someone at The Huffington Post, so it is best to hand it to them on a silver platter. Again, the less you provide to an editor, the more he or she will have to come back to you. This lessens the chance that something you want published will actually get published. By providing an editor with everything he or she needs to simply approve your article, you are greatly increasing your chances of hearing something back. I attached a short bio about myself and the headshot that I use on this site. The person that I actually heard back from was Arianna Huffington herself. After I emailed all of the appropriate editors, I took a long shot and emailed it to her as well. I figured the worst that could happen is that I didn’t hear back. (Note: Arianna’s email is slightly different: arianna@huffingtonpost.com). I emailed her at 5:22 pm on a Monday and had a reply by 9:12 am the next day. She said that she was forwarding my information to one of her editors and I would receive more information shortly. Soon after that I received an invitation to The Huffington Post and was supplied blogging credentials. I am excited to continue contributing and see what other opportunities open up as a result! This is my experience and advice, but please feel free to contact me if you have any other questions on the subject. As always, thanks for reading!! Update: I had my second post go live after publishing this, so if you are interested check it out here! This is so cool. I’ve always wanted to do this! I don’t know why, but pitching to Huffington Post never even occurred to me… It’s something I’d love to do, though, so thanks for these tips, girl! And congrats on your second article getting published! Amanda @ .running with spoons. recently posted…. thinking out loud #116 . Thanks! And go for it! So cool And I’m so proud of you for being so brave to go for it and do it. Also awesome that Ariana herself was involved. I like that type of attention and discernment. Plus, it just reinforces your badassness. Thanks for reading! I hope it helps people out! This is super interesting! Thank you so much for sharing. It’s always great to know how people get published and share their writing. I found that other’s experiences with writing helped me get to this point, so I wanted to be able to share mine as well. Thanks for reading! Great tips, Erin! Thanks for sharing. Saving this post for future reference 🙂 hope you’re having a great week so far! I saw your article last week. Super inspiring! Thanks for reading! Also thanks for inspiring me to mix up my nut butter repertoire!! I’m a little late with this, but SO COOL!! Thanks for writing about how you did it – I would really have no idea how to get started with something like this. I’ve never done any freelance work before, so honestly it’s a whole new world to me! I love that you’re putting yourself out there!! I read a lot of things on the internet from people who had gotten published so since I knew it helped me, I wanted to help out others too! VERY useful info for any blogger! Wow thanks!! Veronica recently posted…Good News This Week! Hey Erin. Quick question…when you submitted the second article did you submit it through the online form AND email the editors or just email the editors? I only emailed the editors. Then I decided to email Arianna Huffington and she’s actually the one who emailed me back! Hey Erin , thanks for the post and I think it’s a miracle to get the exact thing I am searching for. Can you clear me one thing? How should I attach the article ? Should I paste it as plain texts or I should create a .txt file ??? I attached mine as either a Word Doc or Google Doc. Okay got it. thanks for your time . hey I love your page, I have found so much usefull information and think your story is truly inspiring congratulations. I have a small question, whe you submit entries do write new pieces or do you think it is okay to take something that is already on your blog and submit it? Thanks! HP does publish things that have already been published on your blog so feel free to submit one of those! I too am a recovery addict with a story and a mission of HOPE to share…http://www.huffingtonpost.com/mr-johnson/recoverythe-long-road-to-_b_7880250.html. I just wanted to THANK YOU! The advise you presented on your blog assisted me into becoming a blogger for the Huffington Post. I am humbly GRATEFUL. That’s amazing! Great job and I’m glad I could help. Keep up the recovery!! I love the tip to personally address the editor. That is great advice and adds a personal touch. What you chose to write has so much to do with whether it will get accepted. I always say that people want to hear your story. Your personal story is valuable. Definitely worth sharing with the world. Keep up the great posts and live unstoppable! I agree! Glad you found it helpful and thanks so much for reading Rhonda!! Erin, thank you so much for sharing your process. I followed it (to a t) and my article was just published by HuffPost. Also, I’ve checked our your articles and they are wonderful, especially your Breaking the Stigma piece. It is very powerful. Keep shining your light! Thanks for reading Victoria and congrats on getting published!! Keep up the great work! Hi Erin. How soon did you get the email from the editor. I got a reply from Arianna saying ahe will forward my email to one of the editors. It’s been a week now. Thanks. Hi Raquel! I would say wait another week and if you haven’t heard anything email Arianna back again. Congrats! You’re on your way! Thank you for this. Did you attach your article or did you include it in the body of the email? Or, if it was already on your blog did you send a link? some publications are picky about this! Thanks! I attached it in a google doc I believe. Either that or as a regular word doc. Thanks for reading Rachel! Yay! Congrats!! I think it took less than a week. If it takes any longer than that, I would follow up w another email. Did you end up hearing back from the editor who was CCed to from Arianna? If so, do you know how long it took? Thanks. Oh great! I’m glad you’ve found it helpful. Definitely don’t give up on trying. Arianna I’m sure gets SO many emails so keep up the good work and keep reaching out! Serendipity Tess recently posted…17 Things you Must Do in Dublin! I’m so glad it helped! I wrote a couple more follow up ones as well which may help if/when you get published. Thanks for reading Tess! Hi there, congrats to you! Same thing happened to me. I pitched directly to Arianna last week in email, heard back from her Saturday that she wants to feature me, including the editor in her e-mail to send me a password. So, that was Saturday, now it’s Wednesday, and I’m pretty anxious. I’m beginning to think it was all a dream and they changed their minds! Any advice? I don’t want to be overly desperate! Hey Michelle! Congrats! I would give it a little longer and if you haven’t heard anything by day Friday, send a follow up email. You don’t have to be too demanding, just inquire when you should expect to hear somethings and that you’re just following up. Let me know what happens! Hi Raquel! Yes, I think the editor may have forgotten about me… I read your piece. congrats!! Thank you! All you need is to follow that up. Good luck. Okay, I will wait one more day. Thanks very much, and I’ll let you know! The same thing happened to me. I submitted a post to Arianna. She got back to me on a Saturday saying the editor would email me a password. It’s Thursday and I’ve followed up with the editor but haven’t heard back yet. I’m getting a little anxious. Yay! Congrats heather that’s amazing!! Curious as to how long it takes once you are invited to join the community. I was invited to create a profile after they read my article. It has now taken 4 days to hear back or see my post published. Is this typical? It says 24 hours but may take longer. I thought this stage was the “for sure” stage but I’m growing concerned. Hey Kim! If it was over the weekend I would give them a little slack on that but if it hasn’t been published by tomorrow I would definitely follow up with them. I think the longest mine has taken is only a couple days and that doesn’t even happen frequently. I’ve heard from a number of people that their work must have slipped through the cracks and it took following up for things to keep moving. Let me know how it works out!! Hi Erin & Kim, yes I’m concerned too. I’ve submitted my article on 25th through the backstage and have yet to see it published. Just wondering, does Huffpost usually publish all articles that we submit? Or is there a rejection criteria that we don’t know? Hey Joanna! I’ve never had them reject an article but I did have them email me to correct some links I had in one. So I think if there was an issue with it they would email you. I would follow up and email that address. I had to do that with one of mine once and they got back to me. I’m glad this helped you out and I hope they get your article up soon!! Thanks for the info Michelle! Also, congrats on being published! Congrats Kim 🙂 i guess i will have to move on to another piece. Just wondering ladies, where do you all usually get your pictures? Getty, Flickr, Unsplash? If it’s Getty, do you do your own edit so that it appears like the published version or leave it to the editors to edit? There’s usually a watermark sign for Getty. Even embedding it directly doesn’t look like the rest of the pics published. Sorry I’m new at this. In my case they just picked a photo on their own. I didn’t submit with a photo. Keep trying. I don’t have a blog and I’m not a writer. There was a topic I felt passionately about and sent it to an industry magazine as an op-ed and never heard back. Because I really wanted my voice heard I researched and found Erin’s post and took it from there. I don’t imagine I’ll be writing anything for them again but i really respect those of you who can do this consistently. Hi Kim, I don’t have a blog too. Thanks for your reply & encouragement. Hi there. I was finally contacted by the editor the Friday following the Saturday that Arianna contacted me back. I did follow up with an email a couple of days prior. Hope that helps and just remember to be persistent because it does work. Just a quick chronology of events for anyone who reads this post and if you’re interested in being published on HP. I emailed Arianna Huffington with my pitch of the above linked post on Monday 28 March. I received a reply from Arianna (or someone on her behalf) the following day on 29 March, inviting me to blog on HP and was advised that a blog editor would shortly be in contact with me to send me my password. I didn’t hear anything for a couple of days so I politely followed up with the blog editor on Friday 1 April. The blog editor replied the next day on 2 April advising I would be sent my username and password shortly thereafter. I received my account details from the blog team on Monday 4 April. I accessed my account and submitted my blog post on Tuesday 5 April. I didn’t hear anything for three days so I kindly sent a follow up query on Friday 8 April. Again I didn’t hear anything back for a few days before finally on Wednesday13 April I received an email from the HP blog team advising my post was published! So all up, it took two weeks and two days from my initial email pitch to Arianna to get my first post published. And what feels like a personal reward, my post featured right on top of the featured blog posts page and front page of the Australian HP site! 🙂 I decided to save some images of these pages as this would be very short lived. Thank you so much for this info! I got an email from Arianna three days ago and it’s taught me a lot about myself – I have NO patience! I have basically been refreshing my email every five minutes, agonizing about why the blog editor she copied hasn’t gotten back to me. Thanks to your tips, I think I’ll follow up tomorrow. Thanks again! Your blog is fantastic! Thanks for reading Teresa! So glad you found it helpful! Hi Erin! I just wanted to drop a quick note to say that, I too recently pitched an article to the Huffington Post, and, following your advice, emailed various editors and Arianna Huffington herself personally. In a surprising parallel to your experience, I, too, heard back from Arianna herself – just about an hour ago – saying she was forwarding my article to the blogs editor. I am so excited and, well, a little in shock! Thank you so much for the wonderful advice and your amazing blog! You’ve earned a loyal reader here! …I will, of course, leave a link to the article here in your comments when it’s published. E.J. Haley recently posted…There’s the windup … and here’s the pitch! Thanks for all the wonderful advice! I am so happy to take my writing career to the next level. Great article…I agree that current politics has degraded itself to this extent – perhaps even a too large core of our citizenry. Wonderful writing style. Thoroughly enjoyed it. How long did it take after you “published” to become visible to the general readership? Did HuffPost notify you that it was approved and released? Best of luck with future articles. Thank you for the wonderful compliment! To answer your question, it’s my understanding that they (HuffPost) recently changed their contributors platform. I believe the article went live right away. However, I would imagine their editors still comb through contributors’ material to decide what to feature. I am not aware at this point if my article has been featured yet. But, here’s hoping! A big congrats on all your blogging success. Thanks also for this guideline. I have read many blogs seeking information regarding Huff Post, and yours offered the most practical method. It has been very helpful and has landed me an offer to be a Huff Post Contributor. However, unless I missed the obvious, all internet info regarding blogging on Huff Post does not make very clear, or is misleading as to what happens after a blog is “published.” I assumed it became public and accessible to Huff Post readers. 1. There appears to be no menu on their website leading to a contributors’ blogs section. I found this link only after a google search: http://www.huffingtonpost.com/the-blog/. But, after “publishing” my first article, i noticed it did not appear. 2. I am now assuming that blogs are not available to Huff Post readers, nor will they appear on the blog list for the day, unless one of their editors picks it up and “promotes” it. In other words, blogs do not get the large exposure expected, that is proclaimed or hoped for. If I need to promote my blog article and tell audiences they can read it on the Huff Post platform, but only by giving them a direct link to the article, of what value is that? I can direct readers to go directly to my website. What am I missing? 3. Do I have to pitch the appropriate category editor after “publishing,” and hope to be published? Any advice to clarify my confusion or misunderstanding would be greatly appreciated. Also, I read your personal story with great interest. I am in the process of writing my first book regarding the origin and cause of human behavior, and would be very interested and hope to have an opportunity to communicate with you in the very near future, regarding your journey and insights gained. Once you are published yes you do have to pitch, or rather submit, any future articles for approval. But I guess once you have been published your subsequent articles will be more likely accepted anyway (though I had one rejected but I was pushing limits with some things with that). I don’t know whether personal blog accounts are linked or appear anywhere on the site but the published article should appear on the blog page and even the front page until it moves on down the page and archive pages. Thanks for your input. I think I now understand the process. Post or “Publish” your article and then chase the section editors. At least once you are a contributor, it makes the opportunity for exposure to editors more likely. I also have not found an “index” for writers, but then that page would probably be too large. Apologies for my delayed response. Congrats on being published! I’m working on a new post actually about this, but HP has created a new blogging platform called Athena that allows bloggers to publish directly without the intervention of an editor to proofread and publish the piece. This means that many more authors will be able to get their material up. You’re still published on HP, but it may be harder to find the post without the direct link. You are correct about it not appearing on the list for that day unless chosen by the editors, and this is true for both the original platform and the new contributor one. I wrote a post about what to expect after being published because while my first post was promoted extensively, every post after that was lost in the site and not picked up and shared by HP. I had to do the work asking people to share it and promoting it myself, but I still never received the same kind of numbers as I did with my very first one. I hope this helps. If you have any other questions, please feel free to email me at erinsinsidejob@gmail.com. Thanks for reading!! As I mentioned to Steve…I think i now have a handle on things…having an opportunity to be a contributor increases the possibility of being picked up by an editor. I have read that many contributors leave a link to their own Blog Site (outside of Huffington) without having a negative affect on being picked up and promoted. Might you have a comment about that? Yeah, at the bottom of my posts I will usually write something like “This post originally appeared here on Erin’s Inside Job” if I’m reposting content. Then I’ll link both the specific post and my site in general. So far it hasn’t been an issue. Hey Erin! I just heard back from Arianna who CC’ed the blog editor, Madeline. How long does it take for them to follow up? Thank you for your help! Mine was prob within a week but I’ve heard from some people who had to follow up bc I think it fell through the cracks. If you don’t hear within a week, I’d send a follow up email. Congrats!! Awesome!! Thank you again for all your help with this post, as well as answering my question! Can’t wait to see my writing on HuffPo! Thank you so much for writing this post! I did the same thing like you said, and I received an email from Arianna herself. She cc’ed another person and they got back to me this morning, and sent me an invitation to become a contributor. Yay! Thanks so much for your advice and for your excellent writing! Quick question: Did you submit your article specifically to be used as a blog post? And if so did you keep it under 1,000 words? I have an article on wolves that is hard to keep at that length so I wonder if there are options for possible publication on HP that allow longer stories. The post I submitted was what they ended up publishing. I think it was around 1000 maybe even a little more, so I’d at least try it and maybe mention that you can do edits if needed if it’s too long! Thanks, Erin. You help is much appreciated! Your post got me all fired up! I emailed Arianna with a personal essay that I think would fit in with HuffPo, but even if it doesn’t, I feel good about trying. Thank you for writing this! Oh snap! Let me know how it goes! The crickets, they chirped! But it looks like it’s been accepted into another publication, so I’m happy. Becky B recently posted…Race to the Finish: Get “What’s at the End of Your Nose?” now! I think she must have changed her email address or blocked it because arianna@huffingtonpost.com just bounced back to me…. Hi Erinn, Thanks for giving such a lovely information. We want to write on Huff post ,But these days registration at Huff post have been closed. Arianna herself have moved to new venture from Huf Post. What should we do in such case. Pls let me know. It’s really cool! Thank you for sharing your experience. HLTHASK recently posted…What is the difference between Stendra and Viagra? I was thinking of publishing my article on HuffingtonPost thanks a lot, this article is very very helpful. For several years I wrote articles that were published on the huffingpost and then the format was changed and I have not been able to publish since. Many of my previous posts are in the post archives. I am the publisher of Native Sun News Today, and American Indian owned publication and my posts are about things that are happening in Indian Country. Please let me know how to get back to posing.